"A day late, a dollar short," that's me. I brought my stuff home today. "Better late than never," I'm just full of them today. I have two groundhogs today and I will have another activity tomorrow. The first groundhog is very similar to the hibernating bear. Our one Pre-K class made these. You need a pre-cut groundhog that gets attached to a stick and then use a styrofoam cup for his hole and he can pop in and out of the hole. Fold the paper plate in half. 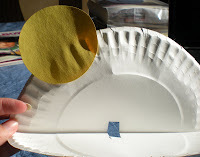 The teacher had cut a small area out of the middle of the paper plate, this is where the straw will slide up and down. Next have the children draw a face on the groundhog, then color the outside of the plate. 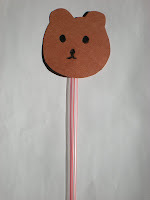 The straw gets taped to the back of the groundhog head. Then glue the poem to the front of the plate and the sun to the inside of the plate. Now slide the straw through the pre-cut hole and the groundhog can pop in and out of his hole. 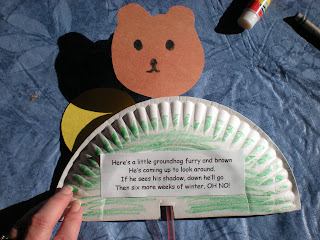 My assistant teacher e-mailed me this link...one of the cutest groundhog day crafts I've seen! My preschoolers will love it! I've bookmarked your site and plan to be back soon! Thanks for sharing!! I agree1 this is the cutest groundhog patter I have ever seen! Been teaching preschool for many years and wanted something diffrent. this is Great! Is there a pattern for the head? Hi Anonymous, I'm sorry I don't have a specific pattern for the groundhog's head. I think I just cut it out freehand--thought it looked good:). Have fun. I found your pop-up groundhog on Pinterest! This is adorable! I just shared it on my blog. You can check it out here Friday's High Five: Groundhog's Day .